Key Difference: The Dell XPS 10 is a 10.1-inch tablet that comes with a keyboard Dock to make it into a laptop. The screen is an HD Display capacitive multi-touch screen, with 1366 x 768 pixels and an approximately 155 ppi pixel density. The sleek tablet has a metal chassis and has a rubber back for better gripping. Asus Padfone Infinity smartphone is a slick 5-inch full HD 1920x1080, Super IPS+ with Capacitive Multi touch panel and provides approximately 441 ppi density. The device is a bar phone, with curved corners giving it a similar look to the ‘iPhone’ and ‘HTC One’. The Asus Padfone Infinity Dock is basically the 10-inch tablet shell that allows users to dock their phone into the tablet by sliding it into a slick slot on the back. Dell is a popular company that is well-known for its customizable computers. It allowed people to build laptops and desktops from scratch, adding only components they need and paying only for those components. It has become a popular name in laptops, but has yet to launch itself in the tablet market. In response to the growing market for tablets the company has launched Dell Streak, which did not manage to garner much positive response for the company. Dell announced in August that is launching its newest table the Dell XPS 10 in October 2012. The Dell XPS 10 is a 10.1-inch tablet that comes with a keyboard Dock to make it into a laptop. The tablet serves the purpose of fulfilling the need for the tablet on the go and a laptop for some serious professional work. The company has launched the tablet on the Windows RT OS, which have not been able to draw in many customers. According to every review website, the company has not been doing that well in sales of tablets due to the Windows OS. 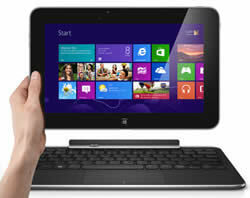 However, the design of this tablet and its features should bring in loyal Dell fans to the product. The screen is an HD Display capacitive multi-touch screen, with 1366 x 768 pixels and an approximately 155 ppi pixel density, which is not the best resolution available on the tablets, but it wasn’t that bad when viewing the tablet. The sleek tablet has a metal chassis and has a rubber back for better gripping. The tablet itself is quite sleek and lightweight making it easier to carry. The screen is small though because of the black bezel on the screen. The screen is made using Asahi Dragontrail high strength glass for durability. The device has a SIM card slot for optional 2G, 3G and 4G capability, if required. The tablet comes with 32/64 GB Flash Storage and also has a microSD slot that allows users to upgrade the internal storage capacity by 64 GB. The system is powered by a 1.5GHz Dual-core processor and has a Qualcomm Snapdragon S4 GPU. The device provides a 2GB RAM, which allows serious multi-tasking capabilities. The tablet provides Bluetooth, Wi-Fi and USB capability. The dock (keyboard), when attached provides two extra USB 2.0 slots on either side. The keyboard is also sleek and thin with dedicated Windows soft keys and trackpad. Both the tablet and the keyboard have a charging port. This is because when docked, the charging port on the bottom of the device gets covered by the keyboard and the user can still charge using the secondary port. The tablet has a 5MP rear camera with autofocus ability, but it lacks a flash. This results in distorted images in dark lighting. The camera also has weak video performance and the sharpness must be constantly updated during recording. The device also houses a 2MP secondary camera that is decent for snapshots and video conferencing. The device houses a non-removable 28Wh 2-cell lithium-ion battery that provides 10 hours, 30 minutes of multimedia time, while the dock has an additional 27 Wh battery that extends battery life to 18 hours, 18 minutes. The device also fared decently during gaming tests. All of the devices are available Office Home & Student 2013 RT that can be changed and customized on the company’s website before shipping. The Windows OS only allows downloading apps from the Windows Stores, which does not have that many choices in apps. The tablet has been designed to be used as a personal tablet as well as a professional laptop, eliminating the need for spending on both. 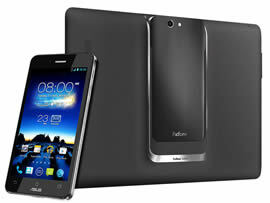 Asus has announced its latest phone and tablet in the Padfone series, knighted the Asus Padfone Infinity. The original Asus Padfone did not reach the Western Shores but the company states that the Padfone Infinity is set for world-wide launch in the second quarter of 2013. Similar to the original Padfone, the Padfone Infinity is available just as smartphone or along with a tablet dock that allows seamless transition between phone and tablet needs. The Padfone Infinity is a pretty intriguing concept that allows the phone to dock on the tablet, which powers the tablet and transfers all the data on the tablet for use. However, without the phone the tablet is just a shell without any ‘brain’ of its own. The phone/tablet is set to provide serious competition to rivals Sony Xperia Z Tab, iPad 4 and Samsung Galaxy Tab. Let’s cover its features separately. The Asus Padfone Infinity smartphone is a slick 5-inch full HD 1920x1080, Super IPS+ with Capacitive Multi touch panel and provides approximately 441 ppi density, making the screen visibly sharp, crisp and clear. The device is a bar phone, with curved corners giving it a similar look to the ‘iPhone’ and ‘HTC One’. The phone has a sleek metallic chassis, with a silver brushed look on the back. The phone is powered by the latest 1.7GHz quad-core Krait Qualcomm Snapdragon 600, providing fast responsiveness from the device. It offers the latest Android v4.2 Jelly Bean. The phone has a 2GB RAM and is available with 32/64 GB of internal storage capacity. The phone houses a 13MP primary camera and a 2MP secondary camera, with HD recording capability. The massive battery power allows the phone to provide up to 19 hours of 3G talk time. The company also introduced a bunch of new features such as Asus Echo, SuperNote, ASUS Story, Instant Dictionary and two years’ free Cloud Storage with 50GB ASUS WebStorage. The Asus Echo is the newest personal assistant, similar to Siri that allows the user to activate a number of features (search contacts, make calls, pick up incoming calls, activate the camera shutter for self-portraits, set alarms, change settings, etc) on the phone using voice commands. The new SuperNote supports real-time handwriting to text conversion and is sensitive enough to accurately translate from handwriting to text. Asus Story allows users to create albums and story lines, while Instant Dictionary allows users to translate words, phrases and sentences in emails, web pages or apps. The Asus Padfone Infinity Dock is basically the tablet shell that allows users to dock their phone into the tablet by sliding it into a slick slot on the back. The slot comes with rubber gromits that ensures that the phone locks into place and does not slide out and fall. When the phone is docked on the tablet, the tablet and the phone synchronize automatically and the apps that were on the screen of the phone automatically re-sizes itself and pops up on the tablet screen. The tablet sports a 10.1 Full HD 1920x1080, Super IPS+ with Capacitive Multi touch panel, similar to the phone, providing a clear and detailed picture on the tablet. The screen on both, the phone and the tablet, have a Corning Gorilla Glass covering. The tablet does not have a processor or anything such hardware on it. It does offer a few advantages to the phone. The tablet houses a 1MP front camera for video calls. The tablet is also capable to output 1080 Full HD video via Micro-USB compatible MyDP interface. The device also has a dialer and is able to accept and make phone calls and send text messages. The phone and the tablet have speakers have the ASUS Audio Wizard audio enhancement providing rich audio experience. The battery as a massive 5000 mAh Li-Polymer, that enhances the battery power of the phone allowing up to 40 hours of 3G talk time. The tablet also has the power to charge the phone three times with a full battery. The tablet starts charging the battery of the phone, when the phone is docked into the tablet. The high-end phone/tablet hybrid comes with a high-end price of EUR 999 and should be around US$ 1300 when it finally reaches the States. The main purpose of such a hybrid is so that people can use one data plan and it eliminates the need for manually synchronizing the tablet to phone and vice-versa. The phone has also been criticized for the lack of the keyboard, which was one of the features available in the original Padfone. Will the phone be a massive success or failure will be seen when the phone finally becomes available world-wide. The information for the detailed table about the two phones has been taken from the Dell website, trustedreviews.com, notebookcheck.net, Asus website and GSMArena.com. Corning Gorilla Glass on both the phone and the pad. GPRS Class 10, EDGE Class 10, LTE, Bluetooth, Wi-Fi, USB, Wi-Fi hotspot. USB, HDMI, Bluetooth, Wi-Fi, with optional mobile connectivity. GPRS, EDGE, WLAN, Bluetooth, NFC, USB, USB Host.